Samsung was the first to come up with the Galaxy S5, and just then, Sony announced its flagship Xperia Z2 which was then followed by the One M8 from HTC. The last in the line is LG, which although is late, but has hit the right area with the LG G3 having some excellent specifications, a beautiful design and given what’s included in it, the flagships from the top contenders could feel the heat already. LG announced the LG G3 on 27th May, and it starts selling right away, thus for those who are interested, here’s what you need to know about the LG G3. The design doesn’t change much from the LG G2 for the reason that the buttons on the back are retained – but we not get no chance to complain as LG has pushed the buttons in, thus showing no bulge on the back, and it is now a flat device from both the sides. Apart from that, LG is the only brand alongside Samsung which doesn’t really give importance to the material or build, because the G3 has the polycarbonate plastic back with the brushed metal look, which looks premium but doesn’t really have any metal on it. That again is one of the reasons why the G3 is light in weight. LG is the first top-tier brand to come up with the Quad HD (2k) display, the 5.5 inch IPS display in the G3 having a resolution of 2560×1440 pixels, which takes the pixel density to a whooping 538 PPI, a lot higher than what the current year flagships have got. And this is not just about the numbers here, because the output is seriously going to brilliant if such Quad HD content is played on the device. When compared to the Full HD display which was used in the LG G2, the pixel size has been reduced by 44% so that the pixels fit into the 5.5-inch panel. The area covered by the display on the front is 76.4%, and the bezels are quite thin. The G3 is powered by the Qualcomm Snapdragon 801 processor, quad-core chipset clocking at 2.46 GHz, and that is supported by either 2GB or 3GB RAM, which depends on the Internal storage variant. The 16GB variant comes with the 2GB RAM while the 32GB one has 3GB RAM. Both the variants have the MicroSD card slot for the storage expansion to a maximum of 128GB. LG has used a removable 3000 mAh battery on the back of the G3, and this is capable of being charged wirelessly, unlike the non-removable 3000 mAh battery in the LG G2. 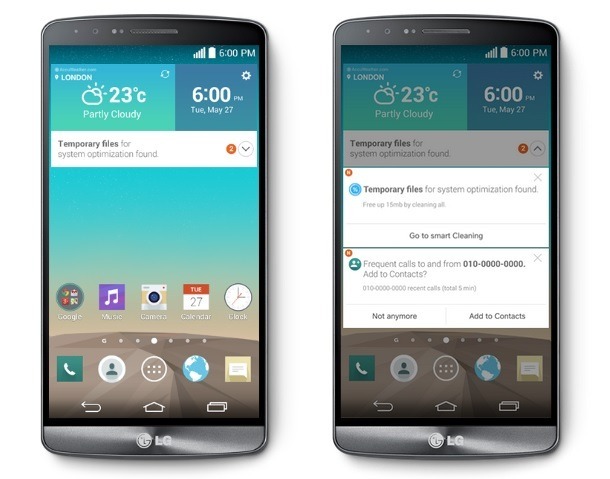 Not any surprise that LG G3 runs the Android 4.4.2 KitKat OS, but what’s good to see is the interface in the device. It’s very much changed and refreshed, with some excellent new features such as Smart Notice, QuickCircle and the Knock Code (which was seen in the recent KitKat based devices from LG). Everything from the icon structures to the home screens, notification panel and settings is changed and it is made even more simplified. There are a lot of improvements and changes seen, and just like the new features such as Smart Keyboard, Smart Notice, Knock Code, LG has decided to reduce the bloatware by merging similar apps and making a single good app. For example, the QuickMemo, Memo and Notebook are merged to make a single QuickMemo+ app which serves all the purposes. There’s apps such as LG Health, Smart Tips to help the user take more advantage from the smartphone. The visual elements which were unnecessary, were all removed from the smartphone interface. Smart Notice is a new feature in the LG G3, which does a job of prediction and recommendation before even you ask for something. This is all based on the status of the phone, location and behavior. It is more of a learning and recommending than a standard set of recommendations. Smart Cleaning: Asks you whether you wanted to erase the apps which have been rarely used in the last few months. Call Log-based Reminder: Reminds you about the missed calls and asks you whether you wanted to call them back. Location-based Reminder: The phone asks you whether to toggle the connectivity when you shift the location, i.e. reach office, home etc. This is a special feature for the ones using the QuickCircle case which comes along with the LG G3. Unlike the Quick Window which was a squarish window earlier in the G2, the LG G3 has the QuickCircle which is a circular window giving an access to six apps which are the ones frequently used, and which get easier to access. Not just that, there is a soft glow around the circle which adds to the aesthetics of the phone. The controls available here are – Pedometer (health), Settings, Call Log, Music, Camera and Messages alongside the other stuff such as Clock faces if at all you don’t have any notifications to check. Knock Code is a way to enhance the security of the phone by locking the screen and unlocking with the new way of pattern unlocking where the pattern isn’t something where you drag your finger over the dots, but tap on the screen in a particular set sequence. Earlier, LG used a unique way of screen unlocking called as Knock On, where just a couple taps were enough to wake the screen up, but now, that is added up with security, so that people tap in a sequence to unlock the screen. There are about 80000 possible combinations with the knocking pattern from two to eight taps as set by the user. This was quite mysterious in the leaks, when there was something like a sensor just beside to the camera, and everyone wondered what it actually might be. That was the Laser autofocus, a first of its kind for any smartphone. The Laster Autofocus is something which enhances the way focusing is done by the camera of the device. The laser on the back of the phone measures the distance between the camera and the object instantly, and thus, the focusing becomes better than the normal autofocus. This helps not just in the bright conditions, but also in the dark where the laser would fix the distance and then the focusing is done. As claimed by the company, the focusing is instant and doesn’t take much time, and the demo showed that around the object was focused in 0.24 seconds. LG has used a 13-megapixel BSI (back side illuminated) sensor camera on the rear side of the LG G3, and this comes with the Laser Autofocus as said above, and there is a Dual LED flash (White + Amber) which comes with two color lights to produce a natural color tone. There’s touch and shoot so that you don’t have to stick your hand on particular area to tap on the shutter icon and capture. LG has made the OIS better to include the OIS+ system which was used in the LG G Pro 2, and here the floating lens is the same but the image processing system gets the enhancements to improve the performance of the capture and the quality of the picture. For the video recording, it would have been a surprise if LG didn’t include the 4K video capture capability in the G3 as most of the recent flagships come with that feature (although there hasn’t been any real good purpose for that), and even the G Pro 2 phablet has the 4K video recording capability. Another area of enhancement in the interface is the keyboard, which LG has improved in different ways – firstly, the size of the keyboard which can be adjusted according to the hand, and gesture typing where a word can be completed with simple gestures, and there is a Quick Move feature in the Smart Keyboard which would help in quick correction with a simple gesture. The LG G3 comes in five color options – Metallic Black, Silk White, Shine Gold, Moon Violet, Burgundy Red. The metallic black has the brushed metal appearance and it is made of polycarbonate material. The connectivity area is where no company easily compromises, and same is the case with LG in the G3, which has the following connectivity options – Wi-Fi 802.11 a/b/g/n/ac, Bluetooth Smart Ready (Apt-X), NFC, SlimPort, A-GPS/Glonass, USB 2.0. Yes you can enable the guest mode in the G3, just like you could in the G Pro 2 (check out LG G Pro 2 tips), and it is a very handy feature for someone who wanted to take care of the privacy, and keep the personal files limited to himself and not open for everyone to see. The functioning is the same as in G Pro 2 and you will be able to enable the guest mode from the Settings section, where you have to set a separate pattern lock if you wanted someone to unlock the screen directly into the guest mode. The variants of the device are firstly based on the color options, and then, you get two variants based on the storage and RAM. The processor too is said to be different based on the location, but in a particular region – you will these two storage options – 1. 16GB internal storage (2GB RAM) 2. 32GB internal storage (3GB RAM).